Award-winning boutique cruise line, Windstar Cruises has announced a return to Alaska sailings in its northern Spring/Summer 2018 ports of call also taking in British Columbia. 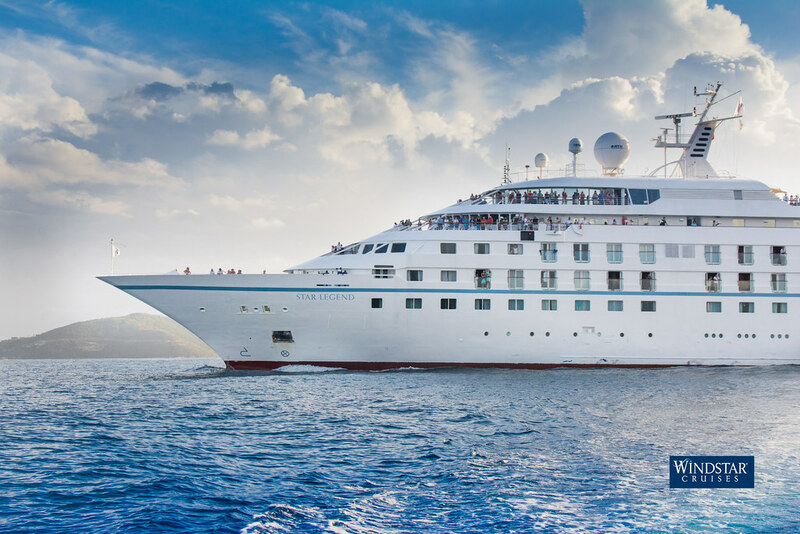 The news comes on the heels of Windstar's recent announcement of its return to Asia in 2017/18, with the 212-guest, all-suite Star Legend yacht sailing from Tokyo to Seward (Anchorage), Alaska over a 14-day trans-Pacific cruise, which also stops in Miyako, Hakodate, and Kushiro in Japan. Windstar's Alaska beckons guests to slow down over leisurely journeys. With voyages starting at 11 days, there is ample time for scenic cruising in both Canada's and Alaska's famed inside passages – where guests can look for orcas, bears, and bald eagles from the comfort of their elegant ship. Star Legend will sail Misty Fjords National Monument and Kenai Fjords National Park, experiences usually booked via a shore excursion because the 'big ships' do not go there. Each Windstar Alaska itinerary includes sailing through Tracy Arm Fjord – so close that noise of the ice breaking and falling into the water during glacier calving will surprise. Enthusiastic park rangers, scientists, glaciologists, geologists, and other experts will be aboard each cruise to provide education, perspective, one-on-one discussions, and ample opportunities for individual discovery in America's 'last frontier'. "We are so excited to be enhancing the Alaskan travel marketplace by introducing our brand of true small ship cruising to Alaska. Sailing closer to pristine deciduous shorelines, delving deeper into all-enveloping fjords, kayaking in icy straits right off the ship's Watersports Platform, and viewing an endless wilderness from sea level. We are bringing our guests right to the heart of what makes Alaska and the Great Pacific Northwest such an amazing destination and magical place to visit," said Windstar President, John Delaney. "We are working hard now to arrange customised bucket list moments like the chance to hike atop the massive Mendenhall Glacier in Alaska's capitol of Juneau, zip-line over crystal-clear creeks in bear country, snap a classic whale tail picture on your mobile phone – during a romantic deck-side dinner, fly over majestic Glacier Bay in a private plane, uncover Sitka's rich Russian heritage, or check out Petroglyph Beach in Wrangell – a destination rarely visited by cruise ships. Windstar is thrilled to put its stamp on this classic cruise region and expects it will quickly become a Yacht Club Member favourite. We honestly can't wait!" Cruising Tracy Arm and Misty Fjords. Optional up-close and personal kayaking and scenic cruising by Zodiac directly from the ship. Sailing right into Misty Fjords and Kenai Fjords, due to small size of ship. Longer itineraries of 11 to 14 days allowing the yacht to move slower and get closer to shore exploring more off the usual charted course. Naturalist/Expedition Leaders on all voyages who will customise the experience for guests along with speakers from Native American tribes. Once in Alaska, the elegant Star Legend embarks on three new itineraries with eight sailing dates, departing May to August 2018, including a 14-day Seward (Anchorage) to Vancouver option; 12-day Vancouver round-trip itinerary, and 11 or 12 day Vancouver to Seward (Anchorage) voyages. Windstar also plans to offer pre and post cruise land excursions, allowing guests more time to explore Alaska's interior. Wonders of Alaska & Canada – These 14-day voyages from Seward (Anchorage) to Vancouver are offered three times, allowing guests a full two weeks of jaw-dropping scenery and history. British Columbia's Prince Rupert, located on Kaien Island just north of the mouth of the Skeena River, is a highlight – a picturesque port rich in culture and heritage. Teeming with wildlife, guests can expect whale, eagle, salmon, and grizzly bear sightings, and also visit the Khutzeymateen Grizzly Bear Sanctuary, with one of the densest remaining North American bear populations. Alaskan Splendors – Multiple journeys between Vancouver and Seward (Anchorage) over 11 or 12 days offer a tour de force of top Alaskan destinations. From the wildlife and glaciers of the Inside Passage to the First Nations totems of Ketchikan; hiking in Haines or sampling its cultural offerings like the Alaska Indian Arts Center, where traditional craftsmen demonstrate their work; to the biggest zip-line in the United States in Icy Strait Point. Islands & Inlets of the Inside Passage – Offering two 12-day sailings, this itinerary cruises roundtrip from Vancouver, passing under the famed Lions Gate Bridge twice, both en route to the rugged coastline and on the return. A hidden gem at the midway point of the Inside Passage sits Metlakatla, Alaska on verdant Annette Island. This locale is the only US settlement of the indigenous Tsimshian people, where guests can visit a traditional longhouse and experience the full regalia of Native American song and dance shows. Windstar Alaska fares start from AUD7163 per person twin share based on Oceanview Suite Cat S for the 11-night Alaskan Splendors departing 31 May 2018. Star Legend, one of the world's most luxurious small cruise ships, plays the casually elegant host to no more than 212 guests. The experience is like sailing on your own private yacht with nearly a 1:1 staff to guest ratio, boasting all-suite accommodations and beautifully appointed public spaces such as the elegant AmphorA and romantic Candles restaurants. The classy and comfortable Yacht Club lounge located on the top guest deck is sure to be the place for spotting whale spouts and wildlife on the shoreline, as cruisers relax with a Captain's Coffee and enjoy the 270-degree indoor/outdoor viewing opportunities. Star Legend's 106 suites offer more room than many hotels, with stylish décor, walk-in closets, marble bathrooms, L'Occitane® toiletries, and a tranquil seating area — all with a view. Alaska-bound travellers may choose from 106 suites, including 36 Balcony Suites with floor-to-ceiling sliding doors that bring fresh air and sweeping scenery indoors; or select one of 64 Ocean View Suites with large picture windows; or splurge on a decadent Owner's or Classic Suite located just below the yacht's Open Bridge, with a stunning view from the private veranda. Yacht guests will enjoy 'destination authenticity' like only Windstar can deliver with regionally themed cuisine, libations, entertainment, speakers and activities, as well as personalised small group shore excursions, and always gracious and attentive service.